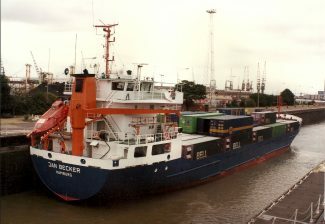 The feeder ship JAN BECKER in Tilbury locks. 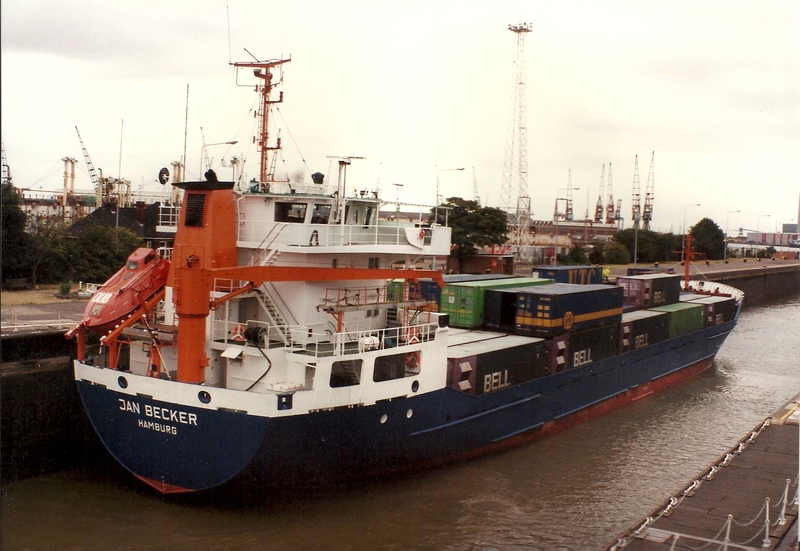 Thanks to charter changes, it is often difficult to keep track of many of the small container feeder ships, and the 1987-built JAN BECKER (2749 tons gross) was no exception. With a container capacity of 262 TEU, this vessel was built for Triton Shipping of Germany. In December 1998 it was renamed TRITON LOGA under the Netherlands Antilles flag, and in 2006 it became MOSA. It was eventually sold by Triton in December 2007 when it became the German controlled and Antigua flagged DAN SUPPORTER (it had then Ukrainian crew) … and it was chartered to a Danish firm. Since February this year, it has been owned in Greece and is trading in the Mediterranean under the name SYROS WIND.